NPFL 2012/13 Team of the Season. Kano Pillars claimed their third title and they are looking like the team to beat as they hope to dominate Nigerian Football. The League Season which started on the back of dispute of no major title sponsors was scheduled to be played on weekends and mid-week due to the late kick off. The introduction of the League Management Company (LMC) before the season the season kickoff saw some improvement in the league as to the live scores of league matches. The league also finally saw the emergence of a title sponsorship which a little bit improved the clubs financially as they were also given prize money. The referees of the Nigeria Professional Football League this season were also assured of their indemnities been taken charge off by the League body. astonishingly change the fortunes of the club after they were tipped to fall into the drop zone. The season also saw the emergence of star performance in the league. A debut season for Etebo was capped my numerous fine performances which saw him grabbed the headlines when he scored the fastest hat-trick in the 3-1 win over Wikki Tourist in the time of 22 minutes of play. He further went on to flourish as his team made it to the Federations Cup final but his goal wasn’t enough to clinch the title as they lost out to Enyimba on Penalties. He had a great partnership with fellow attacker Musa Najare and finished the league campaign with a total of 17 league goals. Victor Namo finished the league campaign as the highest goal scorer and no doubt you have to look in his way and say where did he come from. Move to Nasarawa United from league champions Kano Pillars and then settled down quickly to the side and became an instant hit and also a good penalty converter. Rabiu Ali lived under the performance of Gabriel Ruben and Gambo Mohammed last season as the shine was taken off him a little but he still stood out against them but Gambo and Ruben got the praises for last season. This season, with Gabriel off to Scotland and Gambo still unable to find his feet after a poor Confederation campaign, Ali took up the sole responsibility of being the inspiration and influential player of the Champions. He finished the league campaign with 13 goals, from a midfielder he does have an eye for goals. Naijasportscentre.com League First Eleven: (4-3-3 Formation). DF: Promise James (Kano Pillars), Chinedu Udoji (Enyimba), Solomon Junior (Bayelsa), and Uwaduegwu Ugwu (Enyimba). MF: Rasheed Olabiyi (Enyimba), Christian Pygbara (Sharks) and Rabiu Ali (Kano Pillars). ST: Ogenekaro Etebo (Warri Wolves), Victor Namo (Nasarawa United) and Mfom Udoh (Akwa United). Theophilus Afelokhai (Kano Pillars), Zango Umar (Kano Pillars), Bright Esieme (Enyimba), Ichull Lordson (ABS FC), Raphael Boumsong (El-Kanemi), Musa Najare (Warri Wolves), and Joseph Osadiaye (Warri Wolves). Facts of the 2012/13 Nigeria Professional League Season. Kano Pillars are the first club in 10 years to win back- to- back titles since Enyimba did same in 2001/2002 and 2002/2003. Enyimba FC didn’t concede a single goal at home all season. 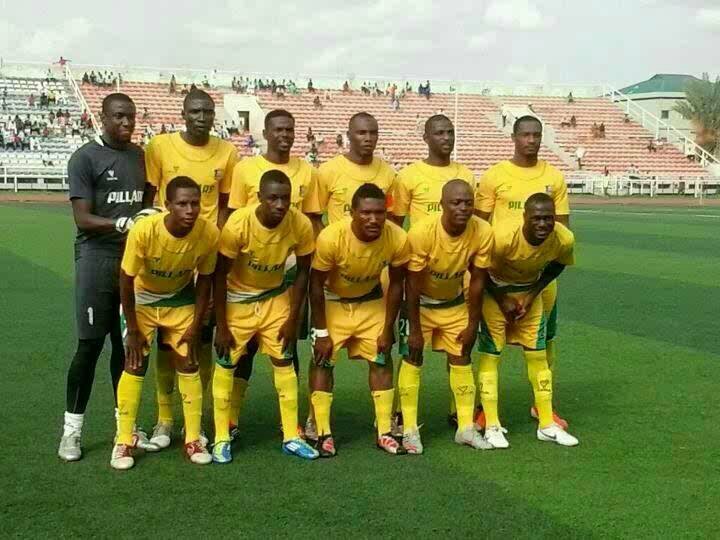 Champions Kano Pillars won more matches (20) overall than the other 19 clubs. Bayelsa United close in on them with 19 wins. The league recorded just 18 away wins all season, 3 of that was achieved by Kwara Utd (that is the highest) but they still relegated. Oghenekaro Etebo of Wolves scored the fastest hat-trick of the season; netting in 22 minutes in his team’s 3-1 over Wikki on September 25. Gombe United and Kaduna United lost all of their 19 away matches apiece this season. The longest unbeaten streak of this season is eight matches achieved by Warri Wolves between match days two and nine. Dolphins midfielder Austin Ekpoma scored the fastest goal of the season; scored in 15 seconds Vs Enugu Rangers on August 25. Fall out of the season. Runners up – Warri Wolves. Previous PostNPFL final battle Preview.Next PostLawal for Sky blue stars. Remo Stars FC Donates New Building Structure To Orphanage Home in Ikenne-Remo, Ogun State. michaeloniks on Week 35 NPFL Preview.